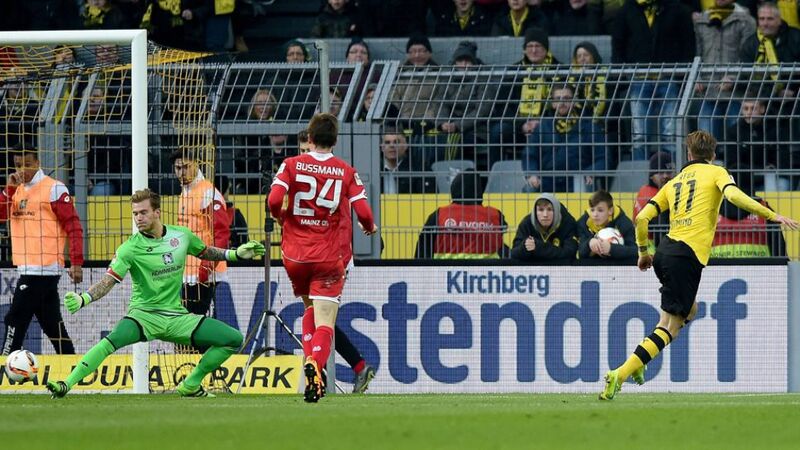 A Borussia Dortmund fan suffered a fatal heart attack during the club's 2-0 win over 1. FSV Mainz 05. Our thoughts go out to all those affected by the tragedy. That about wraps up our coverage of the weekend's events. Catch us again on Thursday for all the build-up to Matchday 27! Until then, auf Wiedersehen! Hamburg have arrived at the BayArena, where the Red Shorts will be taking on Bayer Leverkusen today. Kick-off is at 15:30CET/14:30GMT. Havard Nordtveit is set to leave Borussia Mönchengladbach at the end of the season after it was confirmed today that the Norwegian defensive specialist will not be renewing his contact at the Rhineland club. Nordtveit joined Gladbach from Arsenal FC in 2011. Do not forget to tune in to Bundesliga radio, if you cannot find a local broadcaster screening today's match between Leverkusen and Hamburg. Just click on the link below to tune in to the action from the BayArena. David Alaba has is pleased with his side's win over Bremen, and the return to action of Mario Götze on Saturday. Did you know when the German attacking midfielder last played? Read the match report below to find out. It is also Leverkusen coach Roger Schmidt's birthday today, but will he be celebrating it with three Bundesliga points? Both Bayern and Bremen are back on the training field after their clash on Saturday evening. It may not be a day of rest for everybody, but enjoy your Sunday wherever you are, and whatever you are doing! Can you name the two players in the Mainz tweet below? Bayern have already put in a good shift this weekend, but they have plenty of work to come, starting with this Wednesday. Robert Lewandowski, who netted his 24th goal of the season in the league on Saturday, sounds pretty confident about that Champions League tie, even going as far as to call it a certain victory! Kevin Großkreutz has been ruled out for between six and eight weeks with a muscular injury he picked up against Ingolstadt. We hope to see him again before the end of the season! There were three excellent goals in Borussia Mönchengladbach's 3-0 win over Eintracht Frankfurt, and the Foals want to know which was the best. Good morning and welcome back to our ongoing updates over the Matchday 26 weekend. Coming up today, we have the final two fixtures of the weekend and plenty of reaction to what has already happened. So do not go away, what ever you do! That's it from us today, but join us tomorrow for more reaction to the weekend's seven matches so far and the small matters of Hamburg-Leverkusen and Dortmund-Mainz. Miss it, miss out! After watching his side beat Bremen 5-0, Bayern coach Pep Guardiola was quick to remind people that thought the Reds are now eight points clear of Dortmund in second, they can take nothing for granted. "BVB can win nine in a row, so we have to win our games," said the Catalan tactician. Do not forget to tune in to Bundesliga radio, if you cannot find a local broadcaster screening tonight's match. Just click on the link below to tune in to the action from the Allianz Arena. Claudio Pizarro gets the red-carpet treatment on his return to the Allianz Arena. The Werder striker is a spectator this evening, though, due to injury. Translation: "It was a really intense game right from the off today. The team gave it everything until the last." Translation: "We deserved to win, but a point's a point." Hannover 96's confirmed starting line-up against 1. FC Köln. An impressive travelling support have made the two-hour journey west to Mönchengladbach. Borussia Mönchengladbach are still without defenders Alvaro Dominguez, Tony Jantschke and Oscar Wendt for the reception of Eintracht Frankfurt. Augsburg will honour Darmstadt's inspirational fan Jonny Heimes, who sadly lost his 12-year battle with cancer, by wearing black armbands on Saturday afternoon. Someone in the Bremen camp will have a legendary pair of boots to fill at Bayern's Allianz Arena later this evening. With Pizarro out, who will Viktor Skripnik put his faith in against the defending champions? These are desperate times for Hannover. The Reds are currently seven points adrift of the relegation play-off spot and a further two behind 15th-placed SV Darmstadt 98 and 14th-in-the-table FC Augsburg, who meet today. Even if Hannover beat 1. FC Köln later this afternoon, they will remain bottom at the close of play. It's been a good week for VfL Wolfsburg. Following back-to-back Bundesliga wins over Hannover 96 and Gladbach, the Wolves qualified for the quarter finals of the UEFA Champions League for the first time in their history with a comfortable 4-2 aggregate victory over KAA Gent. Dieter Hecking's side could move to within a point of fourth-placed FC Schalke 04 later today, but they'll have to overcome a TSG 1899 Hoffenheim side fighting for their Bundesliga lives first. Nico Kovac takes charge of Eintracht Frankfurt for the first time this afternoon when the lowly Hesse club travel to Borussia Mönchengladbach. The Eagles are winless in seven, but Gladbach defender Nico Elvedi does not believe that makes his side's task any easier. "Every single Frankfurt player will want to show the new coach what they're capable of," the 19-year-old told club website borussia.de. "It could well be that the change in coach makes our life a bit harder. We'll have to defend as a team and take our chances, if we want to win." It's a pivotal weekend up and down the Bundesliga, and the start of a crucial week for FC Bayern München. The Bundesliga leaders host a Werder Bremen side deprived of the services of injured top scorer Claudio Pizarro this evening, before tackling Juventus in their UEFA Champions League Round of 16 second leg on Wednesday night. The capital club never looked like relinquishing their grip on third place this evening as they eased to a comfortable win over the Royal Blues. Vedad Ibisevic and Niklas Stark scored the goals as Pal Dardai's side recorded their win over Schalke since September 2006. "Home win! 2-0 vs Schalke, 45 points - brilliant!" Arturo Vidal and Franck Ribery are all smiles ahead of the Werder Bremen game. Sebastian Rode insists Bayern's "total focus is on tomorrow's game against Werder". It is not such a long trip for Köln, who are getting the bus to Hanover. Even more injury news, this time from Bayer Leverkusen, who have announced that Sebastian Boenisch will miss the rest of the season after tearing a tendon in his thigh. Get well soon, Sebastian! In addition, Christoph Kramer will miss Sunday's clash with Leverkusen due to whiplash. Bad news for Bremen fans - Claudio Pizarro is not going to make Saturday's trip to Munich due to a groin injury! He and Fin Bartels have both been left out of the squad. As usual, we will be broadcasting a selection of Bundesliga matches this weekend on Bundesliga radio. Follow the link below to find out which games will be broadcast live on Matchday 26, and to listen in. It's going to be a crucial few days for Bayern, who host Werder Bremen before welcoming Juventus to the Allianz Arena in midweek. It has been an historic week for Wolfsburg, who got back to winning ways in the Bundesliga on Matchday 25 with a 2-1 victory over Gladbach, and then booked their place in the last eight of the UEFA Champions League for the first time in their history by beating Gent on Tuesday. Next up are Hoffenheim, and the Wolves will look to crown their week with another three points. After beating Bayern a fortnight ago, Mainz coach Martin Schmidt has now revealed the secret to his side's success, just as they prepare to face Borussia Dortmund this weekend. Here's how skipper Philipp Lahm and his Bayern team-mates warm up for Saturday's clash with Bremen in chilly Munich this morning. New Eintracht Frankfurt boss Niko Kovac (tweet below, r.) seemed in positive spirits as he spoke at the Eagles' pre-match press conference ahead of Saturday's visit to Mönchengladbach. "The team worked very well in training. They can't wait for the game to kick off," the former Croatia head coach said, adding: "Gladbach are very strong at home, but we want to get a result there." Click here to find out more about Niko and Robert Kovac, the brothers now in charge at Frankfurt. While FC Bayern München joust with Borussia Dortmund for the title, Hertha Berlin lead the chase for third place, but FC Schalke 04 are coming up fast on the rails, and those two meet in the capital this evening to kick off the Matchday.